A Basking in the euphoria of the success of its double events, ‘Walk Against Piracy’ and launch of the highly hyped ‘Biometric Card’, held last weekend, it’s obvious things are gradually taking shape with the Performing Musician Association of Nigeria (PMAN). 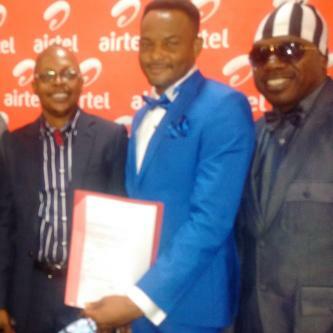 However, the supposed meeting to reconcile the aggrieved factions of the umbrella body of Nigerian artistes has ended in a gridlock. The reconciliatory meeting held at the conference room of the honourable minister of labour and productivity, federal secretariat complex in Abuja, on Thursday 25th of June, 2015, saw Mr Pretty Okafor, the president of PMAN walking out of the meeting as he maintained that he and his executives stand by the judgement establishing the interim executive caretaker committee accordingly. The said reconciliatory meeting was convened at the instance of the Registrar of Trade Union Mrs N. Mbougu had in attendance Mr. Pretty Okafor, Mr. Sunny Neji, Zaaky Azaay, Felix Duke, Dr. Kenny George and Mr Brown Bread, others where Mr Kelvin Lucciano, Orits Williki, Chris Mba and others. The permanent secretary of the ministry of labour and productivity who chaired the opening secession of the meeting and maintained in his opening remarks that the rule of law is paramount, also in attendance were the director of industrial relations Mrs Ilo and other officials of the ministry. After deliberations and debates Mr Okafor insisted that he is not averse to reconciliation but however, true reconciliation would be possible if all musicians in Nigeria including those present embrace the current Biometric Card Scheme for PMAN members, he further affirmed that since there is a judgement in place “Nobody is above the Law” therefore that judgement stands until vacated. Mr. Okafor further advised the house and musicians to eschew bitterness in the overall interest of PMAN Members, music industry and our dear nation Nigeria as our country stands to benefit from the numerous projects and business partnerships put in place by his administration. Meanwhile the suit number NICN/LA/272/15 filed at the national industrial court seeking order or injunction restraining the registrar of trade unions, whether by himself, his agents, privies, or assigns from relating with and or have any further dealings and transactions with the said illegally constituted body known as peace initiative committee or their illegally constituted electoral committee and the following: Mr. Kelvin Luciano Gabriel, Orits Williki, Sony Neme, Alhaji M.A. Sodik, Dr. Tee Mac Itseli, King Feladay, Ital. Bony Kabiru Kahinde, Charles Imoloame, George Dureke, Frank Irabor, Chris Mba, Richard Cole, Adeola Levite Papa Laty, Samson Nwachuwu, Omas Lance Perry, Ade samson, Murphy Van Anthony under the leadership of Mr. Kelvin Luciano in the name of PMAN henceforth. An injunction restraining the respondent by themselves, privies, or assigns from parading and or further parading themselves as lawful representatives of PMAN either in the name of peace initiative committee or under any other name whatsoever or further induce the first respondent to act outside its powers to disrupt and or frustrate the business and administration of PMAN nor seek to proscribe the union has been served on all the parties concerned from attempting to interfere or undermine the current drive has been served on all the parties concerned.